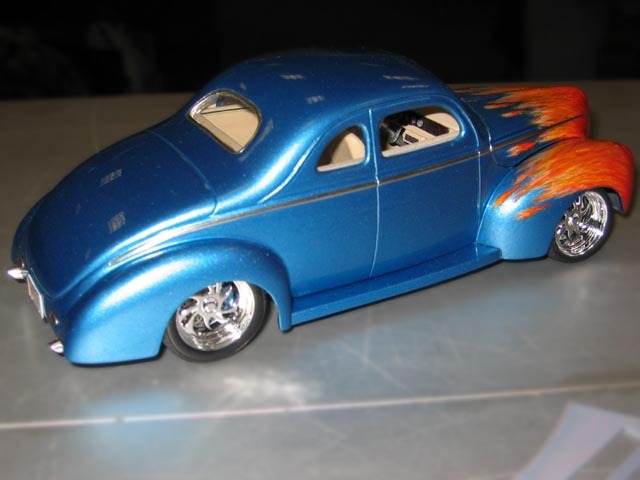 Lyle based this model on a Replicas & Miniatures Co. of Maryland resin chopped '40 Ford body, mastered by renowed car modeler Rik Hoving. This body sits on a Revell/Monogram 1940 Ford chassis and interior. Changes underneath include front suspension from a Revell/Monogram 1937 Ford Stret Rod kit, rear from an AMT/ERTL 1934 ford kit, Mufflers from an AMT/ERTL 1969 Oldsmobile 442 kit, an engine/transmission combo from a Revell Speedwagon kit, and wheels and tires from Pegasus. Lyle bent up a set of wire hinges for the hood.